Rose Gentle, left and Reg Keys. 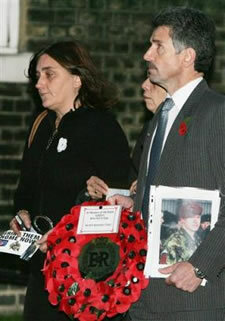 Both lost children because of Blair’s lies. A senior Labour figure in Tony Blair’s constituency has resigned to support an independent candidate. Derek Cattell is quitting in protest at the Iraq war which he said had raised questions about Mr Blair’s integrity. He will instead support Reg Keys, whose son was killed in Iraq and is standing against Mr Blair in Sedgefield. Mr Cattell has been on the executive committee of the Sedgefield Labour party for the last 10 years. He said it was a “big decision” to leave the party he had been a member of for more than 30 years. But despite wanting a Labour government, he could not vote or work for Mr Blair personally. “I’m not prepared to vote Labour through gritted teeth,” he said. Thirty years is a long time to be a supporter, member and official of any political party. It must have been a huge wrench for Cattell to leave. But he examined his conscience and recognised that it was morally untenable to support Tony Blair. Perhaps when the Labout party comes to its senses and evicts the warmongers that now control it, Cattell can re-join it. Mr Keys, 52, is standing on a predominantly anti-war platform. His son, Lance Corporal Tom Keys, 20, was one of six military police officers killed by an Iraqi mob in Al Majar Al Kabir on June 24 2003. He urged other candidates to stand aside to give Mr Keys a free run against Mr Blair – something already done by former MI5 officer David Shayler. Well done to David Shayler for withdrawing – it would be nonsensical to split the anti-war/anti-Blair vote. It’ll be interesting to see if Blair gets a bloody nose in his constituency. Of course, I would love to see him unseated and humiliated but he has a huge majority so I don’t know how likely that is.